A doctor who served the community of North Belfast for almost 30 years has prescribed herself the perfect remedy to keep herself active in retirement. Dr Linda Knox, who was based at Crumlin Road Family Practice, recently hung up her stethoscope but she’s keeping active in the name of charity. The popular former GP is set to cycle from the west to the east of Ireland in the gruelling 200-mile Coast to Coast challenge on May 14. Starting at Enniscrone, Co Sligo, cycling cross-country and reaching heights of 1325 feet through the Mournes, she will descend into Newcastle, Co Down. Linda retired on March 31, having worked at Crumlin Road Health Centre since May 1988. But rather than take it easy in retirement, she has decided to take on the cycle challenge, offering patients and colleagues the opportunity to donate to the Northern Ireland Hospice in her name. Dr Knox knows better than most the support that families receive from Northern Ireland Hospice locally, having made many referrals to the charity over the years. “I have worked at the Crumlin Road Health Centre since May 1988 and throughout that time I have worked with the Hospice Community Nursing Teams to ensure patients received the best possible care at difficult times in their lives,” she said. “The Hospice have been an invaluable source of information regarding patient medications and symptom management. 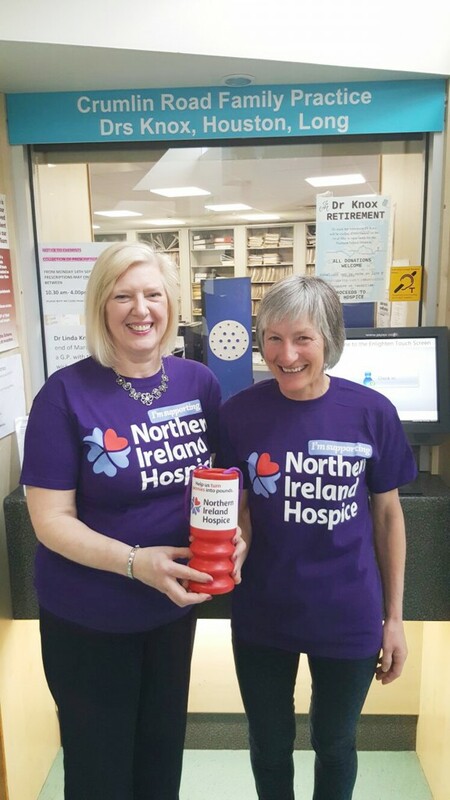 “With this in mind, and the fact that the Hospice is based in the centre of the North Belfast community, I wanted to dedicate my fundraising to them. I am aware that funds are urgently needed for the new Hospice facility due to open this May. “The new Hospice will be the first purpose-built, dementia-friendly hospice in the UK and Ireland and will offer patients and families a warm and comfortable environment, a home from home experience with plenty of space for families to spend time together with privacy and dignity and have access to the professional care they need,” added Deirdre.